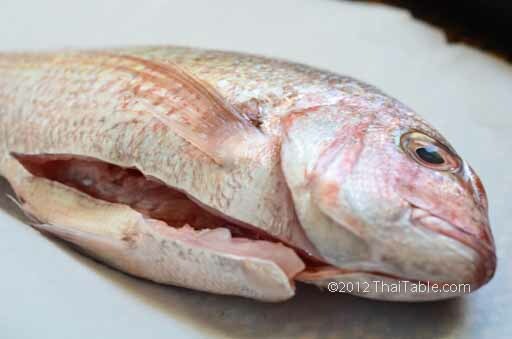 When I was at a fish market in Thailand, I saw a small lady who was choosing and buying tons and tons of red snappers. I asked her what she would do with the fish. She said that her family loved Turmeric Fried Fish. 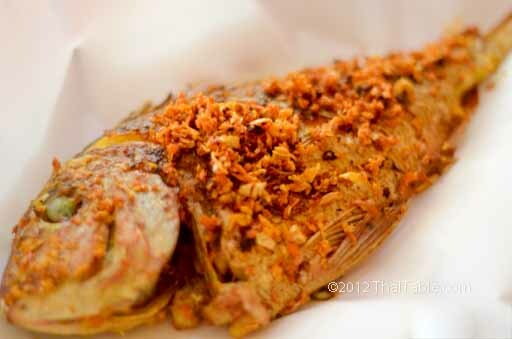 I can see why: in Thailand Turmeric Fried Fish is one of the most popular southern dishes at home and in restaurants. 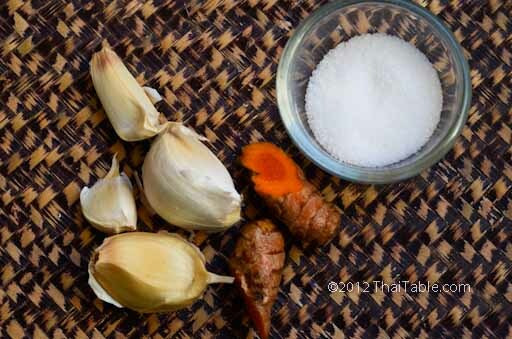 Adding turmeric to dishes gives southern Thai food its own characteristic. 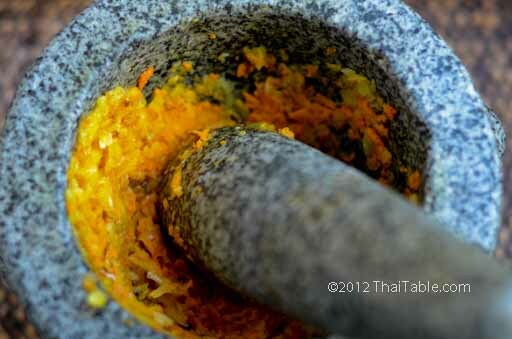 The combination of fresh turmeric and garlic enhances the fish flavor. The crispy seasonings and the slightly crispy fish with jasmine rice is the answer to southern food craving. 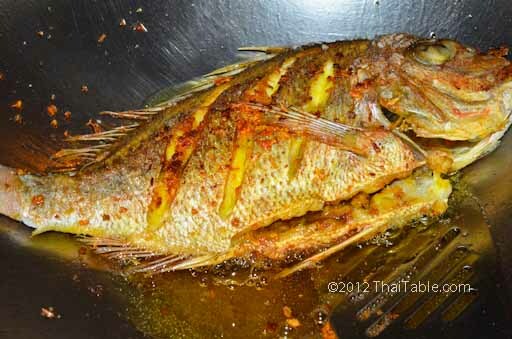 Turmeric Fried Fish is simple to make and great for people who prefer mild food. 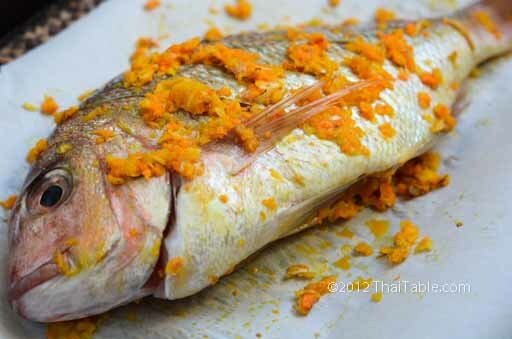 If you are looking for a simple Thai recipe, Turmeric Fried Fish is a good and easy recipe to work with. Mullets are as popular as red snappers for this recipe. Other similar fish will work well too. You can marinate the fish overnight which will allow the seasonings to go into the flesh. The key to this dish is the removal of the seasonings before frying.h The fish cooks thoroughly without burning the smaller pieces of garlic and turmeric. The marinade is then fried later for maximum crispiness. Most Asian markets offer fish cleaning service which is really convenient. The scales and guts are removed. The fish is ready for cooking when you get home. This red snapper is about 1 pound. Heat up ½ cup of oil in a wok. Scrape all the marinade off of the fish and reserve it for frying later. 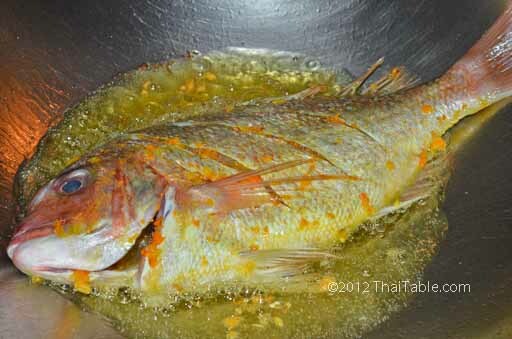 When the oil starts to shimmer, gently add the fish to the wok. Fry the first side for 6 minutes, then the other side for 5 minutes. The fish should be yellowish and brown on the outside. Remove the fish from wok and set it on a serving plate. Add the marinade to the oil and fry for 2 minutes until the seasonings are brown. Drain the crispy seasonings and add on top of the fish. Serve hot. The fish should be brown and slight crispy on the outside. The flesh should be white and soft.